Mostly Republicans and a few good government advocates lined up Tuesday night to tell the governor’s Redistricting Reform Commission why and how an independent commission ought to be created to take the politicians out of the partisan drawing of congressional and legislative district lines. Then there was Sen. Jim Brochin, one of the few Democratic incumbents screwed in the 2011 legislative redistricting. 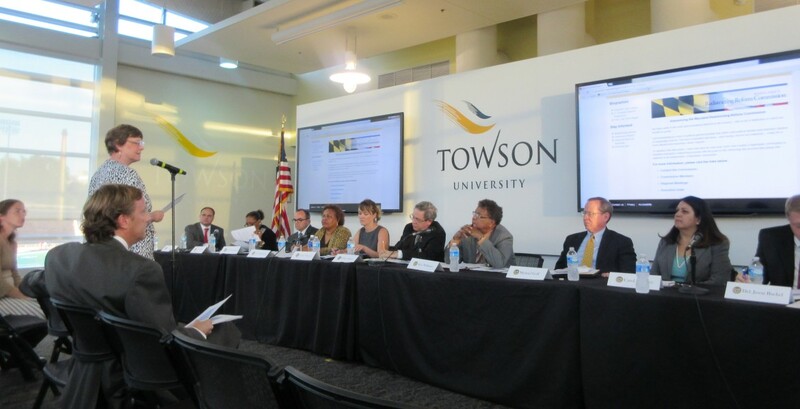 The 11-member commission was sitting at Towson University at the bottom of Brochin’s 42nd district that once was clustered around the Baltimore County seat when he was first elected in 2002. Then, after a series of votes that displeased Gov. Martin O’Malley, mostly against tax hikes and the repeal of the death penalty, Brochin’s district was redrawn to stretch from the Baltimore City line 25 miles north to the Pennsylvania border, adding some of the staunchest Republican territory in the state. Known as a relentless campaigner used to winning by 5,500 to 6,000 votes, Brochin barely eked out a 1,500-vote victory against a Republican. “I believe what the governor [Larry Hogan] is doing is very altruistic,” said Brochin. If Republican Hogan wins reelection in 2018, he could retaliate in reverse, drawing maps “ugly” for Democrats. Brochin had pointed out that the 2002 maps were drawn quickly by the Maryland Court of Appeals after Gov. Parris Glendening’s original plan was challenged in court. Brochin’s opponent, Republican Tim Robinson, a retired anesthesiologist, testified later in the hearing and agreed that the process needed to be changed since too many voters were shifted into different districts. The commission hearing, the first of five scheduled around the state, was kicked off by co-chairman Alexander Williams, a retired federal judge, reading Hogan’s charge to the panel. He observed that half of the Towson campus was in the 3rd Congressional District and the other half was in the 2nd. “Maryland citizens know it is not a fair process,” said Lu Pierson, representing the League of Women Voters. She cited a Gonzales Research poll done in 2013 that found that 73% of all voters, including 68% of Democrats, supported an independent commission over the current system dominated by the governor and legislative leaders. Results of 2013 Gonzales poll showing voters who said they back an independent commission to do redistricting. She noted that while 40% of voters across the state voted for Republican congressional candidates, only one out of eight Maryland members of the U.S. House of Representatives (12.5%) is a Republican. Pierson and many of the other two dozen witnesses who testified favored using the same standard for congressional districts as the Maryland constitution requires for legislative districts. “Each legislative district shall consist of adjoining territory, be compact in form, and of substantially equal population. Due regard shall be given to natural boundaries and the boundaries of political subdivisions,” the constitution says. Even this provision doesn’t prevent political maneuvering, and the league and many witnesses wanted no elected officials or politically connected people involved in the process. “We should not wait till Texas or North Carolina … get it right” — two prime examples of Republican gerrymandering — to act. Jennifer Bevan-Dangel, executive director of Common Cause Maryland, cited examples from around the country of independent commissions for redistricting, with California “held up as one of the gold star models.” California used an “elaborate and complex” system to establish its commission, with members chosen by lottery from thousands of nominees. The legislature could throw out people with political axes to grind. In Arizona, in a process recently upheld by the Supreme Court, legislative leaders selected from a pool of candidates to draw its district, Bevan-Dangel said. Iowa has one of the least political processes, using a computer “to kick beautiful square districts” in that very rectangular state. House Minority Whip Kathy Szeliga raised an issue not even mentioned in Hogan’s executive order. She asked the commission to recommend single-member delegate districts, rather than the two- and three-member districts that predominate in Maryland. “Almost every other state has thrown that out,” Szeliga said. She also asked the commission to change the population criteria in Maryland, which allows a variance of plus or minus 5% in population size. Federal court standards for congressional districts allow only 1% variance. Szeliga’s Baltimore-Harford three-member district has one of the largest populations in the state, while some urban Democratic districts have almost 10% fewer people. Del. Christian Miele, a new Republican from Baltimore County’s 8th District, said he favored single-member districts since it allows for more minority representation and better constituent service. He also favors an independent commission, and had sponsored legislation (HB906) to achieve both goals. But his commission would include members of the General Assembly. Del. Eric Bromwell, a four-term Democrat from the same 8th District, was one of the few Democrats to testify in favor of reform. “I think it has become a political process,” said Bromwell. “I think Maryland can be a leader,” and not wait for other states to reform their process. Russell Kovach, a member of the Harford County Democratic Central Committee, was one of the only witnesses saying the current system worked fairly well. He cited Democrats’ 2 to 1 voter registration advantage, and said the legislature’s current make-up reflected that. Members of the commission listened to the witnesses for two hours, but had little interaction and asked no questions. Asked about the single-member delegate districts after the hearing, Sen. Steve Waugh, a freshman Republican from St. Mary’s County on the governor’s commission, said he thought the members “didn’t feel constrained” by the governor’s executive order to delve into that issue. He also thought that any redistricting should focus on population only, and not other political factors. A Maryland constitutional convention in 1967 had recommended single-member delegate districts, but its rewrite of the constitution was ultimately rejected by the voters because of other changes. The commission will hold four hearings across the state, the next one in Hagerstown on Monday. LAUREL: Tuesday, Oct. 13, 6:30 p.m. Location to be determined. For more information on redistricting reform activities, visit the commission’s website at http://governor.maryland.gov/redistricting-reform. The Maryland congressman who probably benefited most from the state’s partisan gerrymandering in 2012 has also become one of the strongest advocates for reform.